Abbie Gardner, the fiery dobro player, toured with Americana darlings Red Molly for 11 years, gracing stages from Denver to Australia and all points between. The band took an indefinite hiatus in 2015, so Gardner is having a blast doing gigs with different bands, backing up her friends, and stepping into the spotlight for her own gigs. 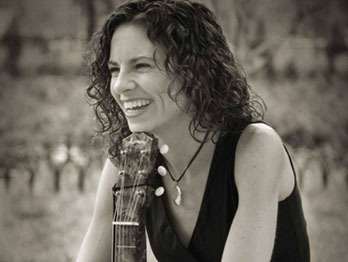 No stranger to solo performing, she has three CDs of award-winning songs from which to draw, each exploring love and loss, both gritty and sweet, and boasting her formidable slide guitar licks. She channels Lucinda and Bonnie, but remains pure Abbie. Her first songbook was published in December 2016 and she’s looking forward to releasing a new solo CD in Jan 2018.